There’s nothing more terrifying, mysterious and addictive than spending a night in Rosewood, PA., the secret and drama capital of Television. My sister, my friend Lucie and I are all huge fans of Pretty Little Liars. I’ve found that the best way to watch this show is to get really into it. I’m talking plan your evening to a tee so the watching experience is ideal into it. That’s why we’re watching the season 4 premiere together in a few hours. 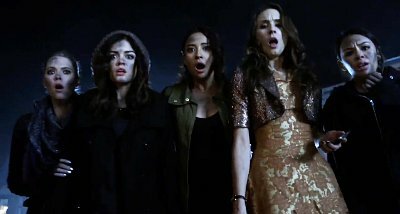 So, behold: A Liar’s Guide to PLL Viewing, the right way. Speak like your favourite character. Take exceptional lines, like Hanna’s “She can’t hear us. She’s blind,” and use them for inspiration. Take the advice of Executive Producer, Oliver Goldstick (I think he was the one to say it), and put cushions underneath the couch in case you fall off while watching. It’s that kind of show – when you react, it’s kind of big and flail-y. Bake Liars-themed snacks. Honestly, I’m too lazy to do this, but I think it would be really cool. We usually just stick to popcorn. CLOSE ALL THE CURTAINS, MAKE THE ROOM AS DARK AND SCARY AS POSSIBLE. This way, your emotions will be heightened and the fear-response won’t be so out of context. Stay away from social media until you’ve watched the new episode. Unless you like spoilers? haha, that does sound fun! I don’t watch PLL, but my favourite shows (I actually just wrote a post about them, funnily enough) are the flail kind too. I love the flail kind of shows.